If you’ve ever felt a “pinch” in your hip in the bottom of your squat, or have worked with a client who complains of this symptom, this article will help educate you on why this may be happening and teach you what you can do to keep your hips healthy and ultimately avoid this painful pinching. Squatting is a basic human movement pattern. Shouldn’t everyone be able to do it? Well, yes and no. Not everyone is created equal; we all have unique anatomy and movement patterns. For most, their anatomical structure and movement patterns will allow them to squat at will in various positions. Others are not as fortunate and will often find squatting feels awkward and makes their hips hurt. If you identify with the latter group, or know someone who does, read below to learn how to make your hips feel better when squatting — or if squats are even an exercise you should be performing. The pinch you feel when squatting is also referred to as femoral acetabular impingement (FAI). Before getting more in depth on this, you must first know that your hip is a ball-and-socket joint. The top of your leg bone serves as the ball, and a cup-like depression in your hip bone serves as the socket. You also have tissue called your labrum that interfaces between the two and is there to help deepen the socket and help keep the ball of the joint in place. When functioning properly, both will interface each other smoothly and your hip will be able to move in many different planes of motion without pain. The pinching sensation occurs when the femoral head (ball) makes abnormal contact with the acetabulum (socket) or vice versa, and your labrum and/or articular cartilage is pinched between the two. When this happens, the suboptimal contact no longer allows your hip joint to move freely, and you may begin to experience pain during certain exercises that require a certain degree of hip flexion and internal rotation, like a squat. There are two types of FAI. Your impingement can be classified as either anatomical or functional — or a combination of the two. 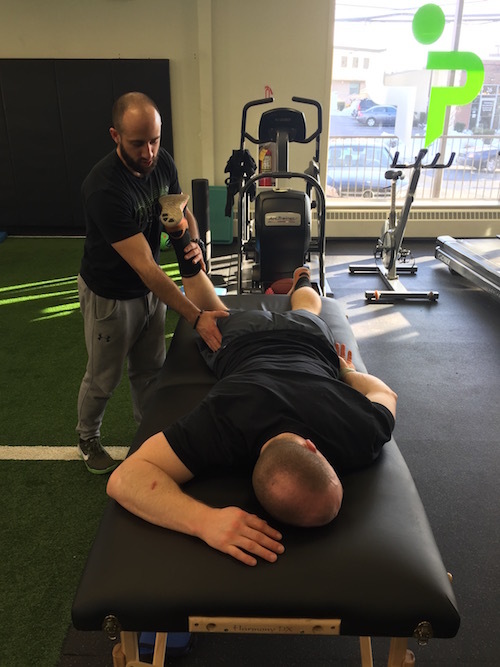 Learning what type of impingement you have is essential for deciding how to get your hips feeling better and potentially get back to squatting during your training program. Now that you know why you feel that pinch, you owe it to yourself to find out why this abnormal contact is occurring. Is It Because of Your Anatomy? One reason your hip may be pinching when you squat is because of the actual structure of your hip joint. This may mean your hips aren’t positioned neutrally in the socket or you have a abnormal contours on your femoral head or acetabulum. Below is a chart of potential structural limitations that can take place at the hip joint. All of these limitations will affect the congruency of the ball and socket of your hip and potentially cause “pinching” during your squat. Just because your hip pinches when you squat, it doesn’t mean it’s because of your hip structure. The inability to control the anterior tilt of your pelvis when squatting can also lead to a suboptimal position of the ball in the socket of your hip, leading to the same “pinching” feeling that those with structural limitations feel. Those with FAI will commonly make a “C-sign” when asked to point to their pain. Will be limited and reproduce pinch. Assesses mobility of quads and hip flexors. Tight quads and hip flexors will make it difficult to posterior tilt pelvis leading to potential functional impingement in the front of your hip. Improve function of hamstrings, glutes, and abdominals to control pelvic tilt and lumbar lordosis. Increase mobility of posterior hip capsule to better position femoral head in the socket and increase hip internal rotation range of motion. Below is a series of warm-up exercises that can help you improve at all three. Why Didn’t I Used to Feel a “Pinch” During My Squat? Femoral acetabular impingement is not a traumatic injury. One particular event isn’t going to cause your onset of symptoms. Symptoms will often increase gradually over time and may start as tightness or weakness in your hip. As the volume and intensity of your exercise program increase, your body will be challenged more and your hip may not be able to meet the new demands you’re placing on it. Does this mean that you need to stop training? No, not at all. You just need to be smarter with your exercise selection and technique. Let’s tackle the big question below. If you have a confirmed cam or pincer, that answer is most likely going to be no. If your impingement is solely functional, then yes, squatting can surely continue to be included in your programming — you just need to be smart with the squatting variations you choose to use as you progress back to squatting. Below is a sequence of squat variations we use to progress athletes back to squatting when dealing with hip impingement. Also listed are the factors that need to be considered while the athlete squats. If you have a structural impingement deadlifting variations (that don’t require as much hip flexion) and single-leg work for your posterior chain are great options to get your lower body strong and keep your hips healthy without squatting. But, because your impingement occurs with hip flexion and internal rotation you need to make sure that the exercises you choose do not demand more hip flexion or hip internal rotation than your body can handle. Check out some great options below. Dealing with pain while training can be frustrating. 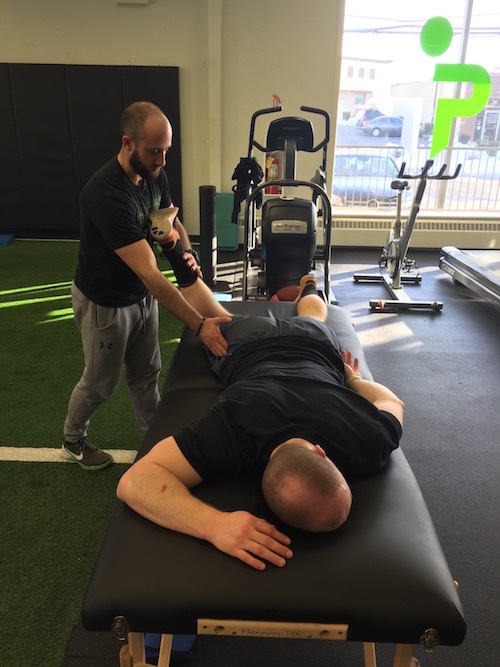 However, learning about why you’re experiencing pain is often the first step towards making adjustments in your training program and getting back on track without having to take a long detour to rehab an injury. Remember: If you’re dealing with hip pain, find a smart physical therapist or movement-centric fitness professional to evaluate you and keep you moving in the right direction.